The very first time that I tasted the unique Burmese speciality ‘Khau Suey’, was when Bibi my talented niece offered me a bowl of what looked like soup, almost 25 years ago. One sip and I was hooked for life! That first bowl of Khau Suey, led to many more and became a must on every visit to Kolkata. I remember mentioning that it was strange that despite there being so many eateries serving Asian cuisine, I had never come across one serving my favourite dish! On a recent visit to Bangalore, I discovered that a vegetarian Burmese Restaurant had just opened at Indiranagar—it seemed like I had finally found a restaurant serving Khau Suey. While I was sure that no Burmese eatery could possibly ignore serving my favourite dish—though I have to admit that I was a bit doubtful that a vegetarian Khau Suey, would taste as good as Bibi’s chicken Khau Suey. Within two days of reaching Bangalore I was ready to check this out at this new restaurant. I arrived at 8 pm with four others to dine at ‘Burma Burma—Restaurant and Tea Room’. Since it was midweek, we had not expected the restaurant to be full and had not made any attepts to book a table. We had to while away almost 20 minutes before we were allowed inside the door. A further 15 minute wait was in store for us and we soon found ourselves sitting on the bar stools at the Tea Bar sipping iced tea. The restaurant was totally full! The wait gave me the time to look around and appreciate the decor. To start with it is a large space - almost 3000 sq ft at least. A few steps lead to the entrance—a wooden door framed by a wooden zigzag trellis and rows of potted plants. As one climbs up the steps, a receptionist welcomes you, but ensures that you have a booking and do not step in until there is room for your group. Inside the door, the hostess is all smiles and guides us to the tall bar stools—apologising for making us wait and suggesting a juice or iced tea. The restaurant has woven cane furniture as well as the most comfortable sofas and tables at the right height. A cluster of large lamps suspended from the ceiling offer an even lighting above the main dining area. There is also a private dining area which can be booked for celebrations. The Tea section is dominated by a larger than life cut-out of a Burmese lady with an umbrella. A collage on the wall with cone-shaped Burmese bamboo hats and shelves with tea pots in varied colours, form the backdrop for serving tea. I was given to understand that the teapots are not only decorations and were also on sale. As the menu mentions, “the cuisine is an amalgam of an all inclusive nouvelle Asian cuisine”. 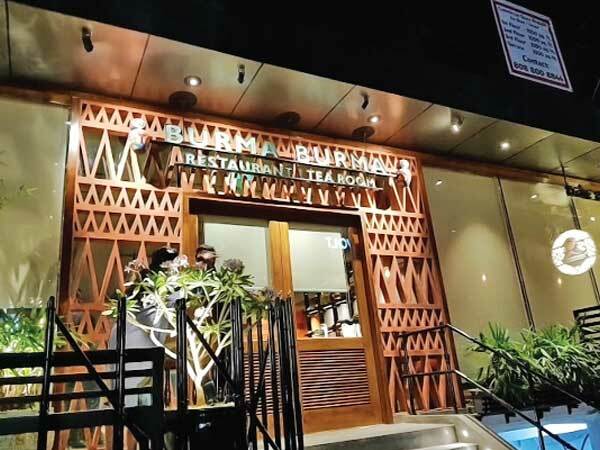 While the restaurant showcases the origin of Burma and seeks to demystify the country’s well guarded cuisine, it also brings in other Asian dishes that have also become part of the cuisine of Burma. For instance, Burmese cuisine also includes ‘Faluda; in their dessert section, while noodles are common to almost the whole of the Far East. I was overjoyed to see that a whole page was allotted to Khao Suey, with different varieties of its basic recipe. I chose the one with an interesting name—‘Burma Burma Oh No Khow Suey’. Oh no or not, I can only say that it was splendid. Totally vegetarian, its coconut milk soup with vegetables and a line of condiments in tiny bowls was totally delicious. This was a meal after my heart. Other soups that were recommended were ‘Ngayokekaung Chinye’ —a Burmese pepper soup and the ‘Tea Leaf Salad’, made with fermented tea leaves, garlic, nuts, lettuce and tomatoes, it is said to be among the best-known Burmese dishes. We also tried out the ‘Mandalay Meeshay’ which consists of a vegetable broth with noodles mixed with hot chilli, garlic and black bean sauce. ‘Tayat Thi Thoke’ a raw mango salad was strongly recommended. The recipe offered cabbage, lettuce and browned onion mixed with raw mango shreds and roasted chilli. By this time we were all quite full. But we were all keen to have a dessert. The final choice was the delicious ‘Tagu Pyi An’, made out of Sago cooked with Burmese palm jaggery topped with coconut custard. The final word about this restaurant is that it gives us a window to Myanmar (earlier Burma). With all the other Asian countries surrounding it, one can expect it to borrow and adapt many of the ingredients and recipes of its neighbours. With this splendid restaurant a whole new Asian cuisine is now open to India’s food-loving public.